*CFT is not commonly called a headswap, but that’s pretty much what it is; removing shelves and unassign-ing disks from a 7-Mode head (HA-pair), and assigning to a cDOT head via the 7MTT tool. I’ve previously covered CFT in these posts from July 2016. The version of 7MTT was 2.3 back then, now its 3.1, but the process hasn’t changed much. I think CFT is super simple, so - if you’re still on 7-Mode, you can take a few hours outage for the HA-pair, and you want to bring your shelves to cDOT (or even if you’ve purchased new shelves, you could non-disruptively vol move from the old shelves post the CFT, and then non-disruptively decommission the old shelves) - there’s no excuse for not using it. I’ve never written anything about CFT rollback, and whilst everyone wants a 100% successful transition, it’s prudent to prepare for a rollback scenario just in case. So in a future post I’ll write about CFT rollback and show it’s nothing to be afraid of. The Disruptive Headswap is of course the simpler and quicker process, so if you have a limited change window, an available window of downtime, or non-disruptive operations aren’t a requirement (perhaps it’s just the DR site), then you might consider the Disruptive Headswap. 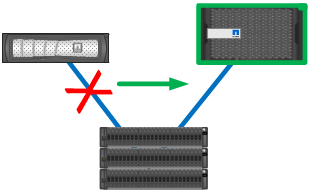 If non-disruptive is required, then Non-Disruptive ARL Headswap it is. One thing to remember with Non-Disruptive ARL Headswap, is that you are a little exposed whilst the procedure is in progress (since there’s no NVRAM mirroring between different models of controller whilst in the interim state) - another Non-Disruptive option is to add new nodes to the cluster, non-disruptively vol move volumes across, and non-disruptively decommission the old. Personally, I would say all 3 processes are relatively straightforward, yet they all need to be treated with respect: prep thoroughly, plan thoroughly, understand the process, understand the plan, and engage NetApp Professional Services if there’s anything you’re uncomfortable with. 3) Non-Disruptive ARL Headswap: Step-by-Step High-Level Notes/Checklist - which became the following 4 part series.